The vessel and five crew members were handed over to officials of the EFCC by the Commander of NNS Victory, Commodore Julius Nwagu. He said, “We are here to hand over the vessel, MT AYSU. It was nominated to lift sludge from the Warri refinery, which it did, but failed to deliver it to Titan Projects in Port Harcourt, thereby contradicting the approval by the naval headquarters and the Department of Petroleum Resources. 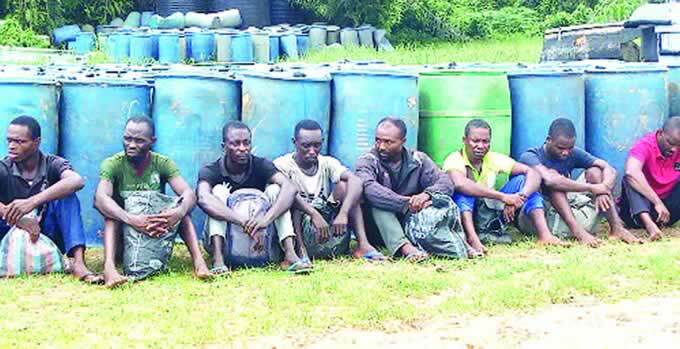 “The vessel had another approval to load and discharge low fuel pour oil to a tank farm in Calabar, but brought a product that was off specification and not acceptable. “Based on that, the naval headquarters directed that the vessel should be impounded and handed over to the EFCC.” He said the vessel was seized on January 31, 2019 transporting 1,500 metric tonnes of cargo though it had the capacity to transport 8,000 metric tonnes. While receiving the vessel and the crew members, the acting Zonal Head of the EFCC in Cross River State, Alex Ebbah, said, “We are going to investigate and prosecute the suspects.” Earlier, Nwagu had handed over three suspected rice smugglers to the operatives of the Nigeria Customs Service along with 190 bags of parboiled rice worth over N3m seized from the suspects. The suspects were identified as Bassey Edet, Sunday Okon and Okon Asuquo Akan. They were received by the officer in charge of the Eastern Marine Command of the NCS, Assistant Comptroller of Customs Jike Johnson, who promised to prosecute the suspects. The rice was allegedly being smuggled from Cameroon to Oron when it was intercepted.